MANY imported (originating in Asia) guppies have entrenched microbial issues... Columnaris, Mycobacteria... that they die simply from. TRY to buy locally produced stock if you can; OR barring this, fish that have been in stock (and not mixed w/ new) for weeks. Please help me and direct me to the medication that will save me from this disease . (didn't know about quarantining) and later that same day I fed them all live bloodworms for the first time. All the guppies (including the 2 new ones) seem fit and healthy apart from one of my original guys (a beautiful sunset tail). Within hours of me adding the new guppies and feeding them all bloodworms (which he definitely ate) he was hovering at the bottom of the tank looking very miserable. He keeps away from the others (not that they bother him) and every time he tries to swim even half way up the tank he spirals back down and crashes into the gravel. He has a red lip where he crashed into the gravel (poor thing). He is still eating bits of flake that fall to the bottom and his poop is coloured red and a bit stringy. He's lost a tiny bit of weight and has paled but there aren't any other visible symptoms. He's been like this for 5 days and has been hiding in one of the ornaments but comes out when he sees me (friendly little guy) but stays at the bottom. I'm worried he perhaps got a parasite from the live bloodworms or has picked up a disease from one of the new guppies (although they are both fine). Any advice would be really appreciated. <Hello Andrea. When it comes to farmed fancy Guppies, I'm not an optimist I'm afraid. The quality of what you see in the UK trade (and likely elsewhere) is barely fair-to-middling, and they are plagued with bacterial and parasitic problems best dealt with by quarantining before putting them into the main aquarium. In any event, given where you are now, the chances are this chap has some type of bacterial infection similar to Mycobacteriosis. It is definitely worth treating as per Finrot, in the off-chance we're dealing with an Aeromonas or Pseudomonas-type infection. 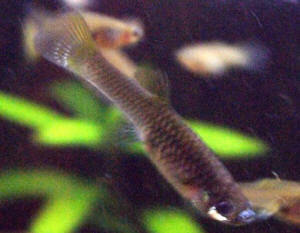 At first I suspected my Endler's Guppies contracted Columnaris from a male Cobra Guppy I had just bought recently. I lost about 15 Endler's Guppies in my 2.7 gallon tank and about another 15 in my 5.5 gallon tank. Now I suspect that it was "Guppy disease" caused by the protozoan Tetrahymena. How do I get rid of this disease/organism from my tanks? Should I bleach my tanks with chloral, hydrogen peroxide, or potassium permanganate? How do I sterilize my other fish (not guppies) that survived if I want to later move them to my other aquariums? Lastly, where can I go to publish this topic on your website? I think I used the wrong terminology. I didn't actually mean publish my topic but post my topic as I've seen a couple of times in the past you had some pages on your website that had people asking questions and then you and/or some other representatives of the website would answer the question. A few days ago, I spoke to the fish expert at my downtown Petco and he said that besides Guppies, Comet Goldfish were also highly susceptible to Tetrahymena. Is this true? He also mentioned that Comets had a somewhat better survivability, esp. if they were larger in size. Does this also correspond to what you've read/heard? I now have mostly just fry in my two formerly Tetrahymena (or Columnaris or Fungal) infected aquariums- a 2.7 and 5.5 gallon. I just noticed that one of the fry in my 5.5 gallon now has some whiteness in the area by its dorsal fin. What disease could this be? I'll see if I can get a decent photo of it or not. I lost about 15 Guppies in just a matter of 5-10 days for both my 2.7 and 5.5 gallon tanks. Can Mycobacteriosis like Guppy Disease and maybe perhaps Columnaris also wipe out a large number of Guppies in just 5-10 days? The symptoms I observed were a white saddleback around the dorsal fin area and some white patches around the body. During the last 2-3 days of life many of the fish in the 5.5 gallon tank also had a white string hanging out at almost a 45 degree angle from their anuses. Does this sound like Mycobacteriosis? Hi, I was wondering if you could help us out. Rus Wilson over at Aquarimax.com recommended that I ask you for your thoughts. I would be grateful for any advice at this point. We have 3 male Guppies we got in December 2014.
we have started adding a small amount of salt to the tank, they are active and eating well but we cannot shake the fin rot. We used Melafix and Pimafix. Then we used Furan-2. Now we are using Maracyn-2 and Maracyn. We are trying everything. We love these fish. We had four- sadly last night one passed away. I have done a ton of research online and everyone seems to suggest different things- it's very confusing. So we are just working our way down the list of meds we know of. We are planning on trying Kanaplex next. If you think you could offer any advice that would be amazing! 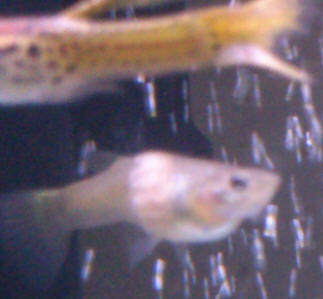 They are not pet store Guppies, we got them from a breeder online. We have one Albino Blue Sky and two Black Moscow. The Albino blue gets red edges on his tail fin. The Black Moscow get white edges. Their tails are not too bad- a bit tattered, some are in better shape then others. All the fish are active and have been eating well for the whole duration of the Fin Rot. The one who passed away was active and eating up until the day before he died. Tank is five gallons with two teaspoons of salt. <This system is too small to be stable... this is the primary issue here. We do 25% water changes weekly. All water Parameters are good. PH is 7.6 and everything else is at 0. We have been feeding Hikari Guppy food and I recently started feeding frozen Brine Shrimp. We are going to add VitaChem to the water starting tonight to try to boost their immune systems. We have two live plants- a Java Fern and an Anubias. Thank you for taking the time to read this and I hope to hear from you. Sorry about the missing details I'm not an experienced hobbyist. These are my first fish as an adult. The filter is the one that came built in with the tank. 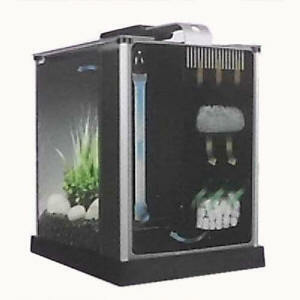 It's a Fluval Spec V. It has a foam block, carbon and biological media. I attached a picture of it. 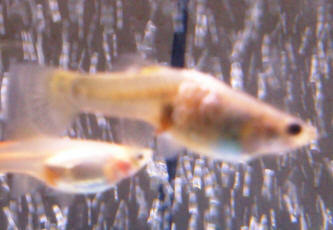 We feed Hikari Guppy food and Recently started feeding Frozen Brine Shrimp. We added Vitachem to their water tonight. We keep our tank clean, we do the 25% change every week, we use Prime and Safe Start. We cycled the tank for four weeks before we ever put the fish in it. I test the water regularly with the API Freshwater Master Kit and we have never seen the numbers rise or spike at any time while we've had the fish. I feed small amounts and avoid over feeding. In addition to the live plants I mentioned in the last email, we also have Malaysian Driftwood and twisted Rose Wood in the tank. The salt we use is API. Temperature range is: 77-82 but usually it stays at 79. We always bring new water up to temperature before adding it to the tank. They do have an air stone. We don't see much Algae but we do get some Black Beard Algae. Another thing I will just mention in case it means something is on the Drift Wood we have tiny little white specks that appear to be a tiny bug we have had them as long as we've had the fish. We've never seen them on the fish- only on the wood. I asked about them once in a forum and was told not to be concerned about them that the fish will even eat them. They don't go on your fish. I apologize this is so long but I want to provide you all I can, so if you have any other questions that may help you help me please ask away. Thank you for getting back to me and I hope to hear from you soon. Thank you so much. We are going to take your advice and try the things you mentioned. (removing the wood, getting the water tested tomorrow, getting those plants and lowering temperature. )I'll let you know what the fish store says about the water when they test it. Thanks again! I'll be in touch. We had the water tested at the store today. They got the same readings as I did. The three nitrogenous waste compounds are showing to be zero or very close to zero. We removed all the wood. We purchased another plant and some duck weed. <Duckweed is a good nitrate remover, but a pest in many fish tanks. Certainly buying it is a first! You can usually find out own in pretty much any pond on the planet. But in any event, you need a floating plant that grows rapidly. Other plants have little impact on nitrate because their growth rate isn't sufficient. Furthermore, floating plants have long roots that hold plenty of filter bacteria, so they also help improve biological filtration as well as directly removing ammonia from the water as well! They did not have water sprite. In your opinion should we wait and see if there are any changes or should we add some kind medication? One day suddenly I started having guppies die no symptoms at first. Cephalexin and Kordon's plus again. One day suddenly I started having guppies die no symptoms at first. Then I noticed a little spot like Ich on the fin under his belly he died super fast. I started using Kordon's Ich plus then I started seeing other symptoms like discoloration it would spread fish would die. I added Furan 2 did no good. I switched to Cephalexin took some moss out of tank just because it was getting caught in filter. Anyway the deaths stopped after 5 days off 500 mg Cephalexin per 20 gallons. I lost at least 20 guppies. I have went 2 weeks without any symptoms I put moss back in that was in Betta tank 3 days ago Betta is fine, now I have 5 guppies showing same symptoms. My ammonia is 0 nitrates 40 nitrites 0 pH 7.6. I have enclosed pictures. The first and her scales have turned white on half her body they look swelled. The second one is another one where the discoloration is starting. I have started Cephalexin and Kordon's plus again. Trust you have all had a great weekend so far. 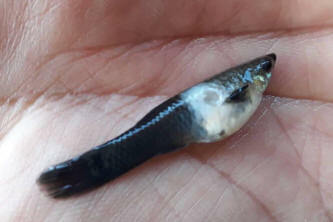 Earlier today I noticed that one of my female guppies had strange white around her mouth and her left eye looked a bit cloudy see pix attached is this something to worry about? <? What is this? According to Google, furniture polish? A Furacyn product? for 30 min.s in a separate container. Have place her back in main tank with in a separate small birthing net. Is this ok or should I remove her completely (euthanise). Love your sense of humour your a cool guy I meant JBL Furanol 2. Just wanted to say that after five days of Esha2000 treatment and careful monitoring (as well as euthanasia of four badly infected fish / fish with dropsy), the tank appears to be settling and those with some cotton mouth / eye coverage are in remission. I haven't done any water changes yet but with a combination of less food (brine shrimp rather than flake food) Esha2000 treatment, lowering the tank temperatures (as far as I am able) to 74 degrees, it appears to be having positive results. Hopefully in a few days, all signs of cotton mouth will have gone and I can start to introduce some water changes to bring the tanks back to non-medicated states. Thanks for all your help and support. I almost gave up on keeping fish but have decided to keep going, but not to replace my stock with guppies (they are just too genetically weak). However, some important learnings have been taken on board! "I'm in the mood for a moray, simply because they're finless... No P1's or pelvics, I'm in the mood for an eel"
what's the song Bob? I don't know the original fishless version. I bought guppies off the internet. American whites. I kept them separate from my tanks for months. Something is wrong with them. I’m not sure what it is. I thought maybe it was their genetics but I have since added a female from my other tank that is now very ill. She was the fattest and plumpest most beautiful fancy female. Now she has removed herself from the herd. She is droopy and looks likes she’s starving. Her big fat belly is gone and she is full of babies that I can see. There is nothing protruding from her. No spots, growths or wounds. My water is hard. I practice regular water changes and they have a heater to keep the tank warm. Good Afternoon to you (or perhaps Good Morning/Evening etc!) all. I'm almost ashamed to be asking this, but I've spent quite some time checking the "before you ask..." sections, alongside Google and other search engines, and I can't find a satisfactory answer to my problem. Please feel free to shoot me down in a blaze of scorn for being too short-sighted/ignorant to see what 's probably right in front of my eyes, but if it saves my fish then I'll happily take it! I have a small 10 gallon planted freshwater tank. 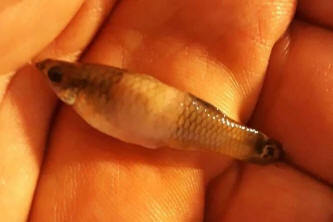 <Honestly, a bit small for Guppies. I know they "fit", but they rarely work well. 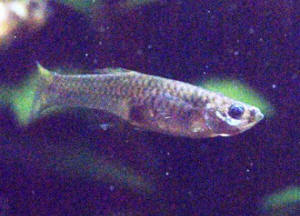 Guppies are quite aggressive, the males chasing one another a lot. In a 10 gallon tank you tend to end with one bully and a bunch of terrified, battered males. Females get pestered to frustration. Even 15 gallons is tight for Guppies, and I really don't rate them for small tanks at all. I introduced my first fish after a month of fishless cycling (back in October last year) and have always followed your advice about slow introduction of tank mates to prevent problems with the bio-load vs. bacterial balance. Up until recently, I had 4 Guppies, 7 Neon Tetras, and 1 Dwarf Gourami (and no intention to add more fish). I undertake partial water changes (varying between 20-25%) at least 3 times each week, and my most recent NH3, N02 & 3 readings from this morning were: NH3/N02 - not registering at all, NO3 12ppm. I understand that these are all within the acceptable parameters. My four male Guppies all seemed (note the tense) to get along very well with one another up until about two weeks ago, when I came home to find two had had rather a brawl in my absence. One had his tail ripped almost to shreds, and the second was not much better. My LFS sells nothing more useful than Melafix - I know WWM's general consensus re: "fixes", but for a preventative rather than cure, I figured it would stave off Finrot to allow them to heal. <Hmm... actually, for Guppies, the best preventative is salt, since they tolerate quite high salinities very well. Fungus doesn't grow in brackish water for whatever reason, so this is a cheap and easy fix. The downside is that Neons and Gouramis don't like salty water. But, Neons also need cooler water that Guppies, so the two species aren't a good choice. Neons are best kept around 22-24 C, while Fancy Guppies at least need around 28 to 30 C.
Unfortunately, the other healthy Guppies started bullying their injured tankmates, and the two poorly boys died within two days (probably from the stress of it all), and at the time of death decidedly underweight (hollow bellies - loss of appetite or bacterial infection?!). I have so far only found one of the deceased, and have stepped up my water changes and gravel hoovering to four times weekly until I find the other, as I know the decomposing corpse will otherwise cause problems. In addition to this, he developed a tendency to shimmy near the heater (I initially thought there might be temperature issues, but the tank's at a constant 26.5 degrees C.). In the last day or so, he's started hiding in amongst the plants for some peace and quiet, and like the doomed others before him, is now showing no interest at feeding times. For your information, the remaining Guppy, Dwarf Gourami and Neons all appear perfectly happy and healthy. you're familiar with this particular UK brand of medication, but the active ingredient is silver proteinate (which appears to be a generic antibacterial used to clear "most fish ailments"). It may be that it's already too late for my little chap, but I'd be so grateful for your thoughts on what the cause might be, and if there's anything else I should be doing for him? Whatever the answer, thanks for your time. Your website continues to be my fishkeeping bible and is always my first point of reference. Keep it up, for all our sakes!